I remember a point in my life when I was about 20 when I realized that the laughter and innocent joy so often present through my youth was appearing less and less in my life. It seems like those days of magic and unlimited possibilities were far behind me. I remember with sadness that I had to accept this ‘adult’ life and this is what it would be like from now on. But I had not yet met Amma! 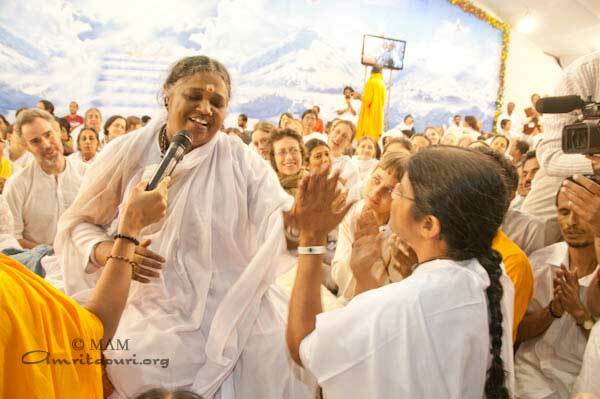 Amma has shown me that this simple joy is not lost but is ever present. It is like there is beautiful music coming from within us. We just need to tune in and hear it. But I had forgotten how to do this. On the way from Mumbai to Ahmedabad, a ’16 hour’ journey through the states of Maharastra and Gujarat, we had a dinner stop with Amma. We all sat in a small temple courtyard surrounded by trees, the night sky visible through the branches of a large tree that canopied the tour group. After serving dinner and talking to everyone for a while, Amma started singing. She was very happy and was showering beautiful loving smiles on all her children who sat around her. With playful spontaneity while singing, Amma started playing with an ashramite sitting beside her chair by clapping, alternating hands with her. Everyone loved this and soon everyone in turn was clapping their hands towards Amma’s hands from where they sat. Many people may remember this simple game from their childhood. In India, and especially in Gujarat, where we were going, this is known as ‘Ras dance’, which is a dance between Radha and Krishna. Soon, everyone was laughing and clapping their hands with the people next to them and with Amma. At the end of the song Amma shouted ‘Mata Rani Ki’ many times and everyone responded with a resounding ‘Jai!’ joyfully raising their hands to the night sky. Amma told us all to laugh and shake our hands towards the sky. I felt like we were sending our laughter to the whole universe. She said when we laugh we should wish that the whole world would also laugh with us, that we should want everyone to feel the joy that we feel. Amma says we are all connected, that all our actions reverberate throughout the whole of creation and that we are not islands but links on a chain. So the next time you feel happiness and love within you can joyfully pray and share your joy with the whole world like Amma has with us! Everyone was happy, refreshed and ready for the next part of the journey, as we boarded the buses. May we all shout joyfully: May all the beings in all the worlds be happy!